Looking to sail from Lefkas? Search to find and book your ideal boat, or read everything you need to know: prevailing winds, where to sail, how to get there and more! Lefkas is the biggest charter base in the Ionian and is wonderfully located for exploring the Ionian islands. You can choose to sail North to the Paxi islands, Parga and historic Corfu, or, more traditionally, sail South to head to the idyllic Sivota, classy Meganissi, amphitheatrical Ithaki and the incomparable Kefalonia. Sailing South, you'll find wonderful scenery of beaches, cliffs, caves, pine forests and crystal clear seas, plus idyllic villages, secluded coves and a relaxed pace of life. The Ionian islands have been popular with sailors for thousands of years - the Greek legends Odysseus and Achilles sailed around these islands on their various quests (Odysseus is believed to have lived on Ithaki). They all loved the dependable sunshine, reliable winds, terrific scenery, and local hospitality. 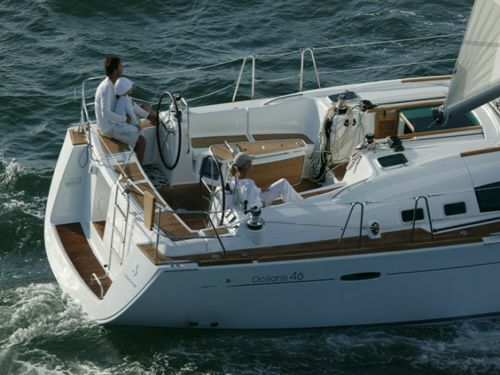 You'll love it too - book your charter yacht today! From Lefkas, you can either head North towards Parga, the Paxi islands and Corfu, or South to Meganissi, Ithaki and Kefalonia, plus the tourist resorts of Sivota and Sami - all beautiful places with breath-taking scenery and outstanding beaches. Arriving into this port by boat is spectacular – the whole village is built up around the natural harbour to make it feel like the marina is in a gigantic ampitheatre. Wow! The dusty streets of Sami in Kefalonia were the setting for the famous Captain Corelli’s mandolin book (and film). Is this the most beautiful island in the Mediterranean? Lots of people think so! 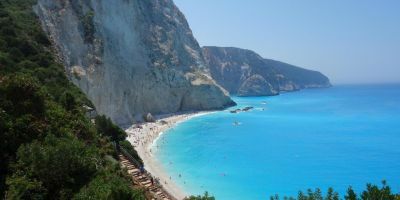 From Lefkas, it’s a difficult choice of whether to head to the North Ionian – with the Paxi islands and Corfu – or the Southern Ionian down to Kefalonia. 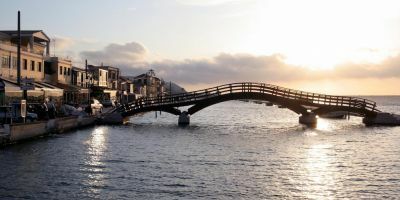 For this itinerary, we’re going south, but if you want to read more about the North Ionian, check out the itinerary we have written for Corfu. 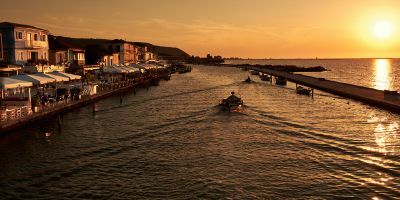 On the assumption that you might not be able to do any meaningful sailing on your arrival day, and with the knowledge that you’ll have to return your boat to base by Friday evening before checking out, this just a 6-day itinerary. It takes in magnificent scenery, fine beaches, cute fishing villages, and secluded bays. In total, this route clocks in at 106 nautical miles, which should mean that you have leisurely days of sailing – you should be able to get speeds of at least 5-6 knots on your yacht or catamaran, so it works out at about 3-4 hours of sailing a day, but longer if you find bays or beaches pop into for a swim, or find somewhere to throw down the anchor for a long lunch. After completing the check-in, the boat is yours for the week. Check you have everything, and that it works, and then it’s time for our adventure to begin. 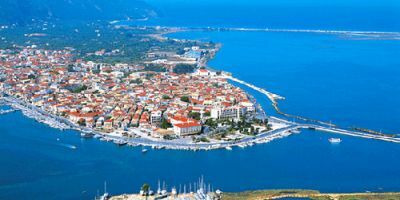 Lefkas is one of the biggest charter bases in Europe, so you’ll doubtless see a long line of charter yachts leaving the marina – all full of excited sailors who are eager to get the sails up. Leave via the South of the marina and follow the channel (and all the other boats) pretty much due South. If there’s a prevailing wind, it should be just behind you, so you’ll be running down the channel. A lot of the charter yachts will be heading to Meganissi on their first day, but we’re trying to avoid some of the traffic and get ahead of the game by doing the extra miles to Kalamos, heading East past Meganissi (have a quick look at Vathy on Meganissi as you go past, as that’s the final port of call on this itinerary), and then following the coast around to the small village of Kalamos on the South side of the next island. Kalamos is a small village now, but this island has a bit of a crazy history – it was once a key Roman island, and they built a fort here to defend against marauding pirates. Later, despite being so small, it once housed over twenty thousand Greek refugees (mainly women and children) during the Greek revolution against the Ottomans in 1821, and people similarly sought refuge here in during the Siege of Messolonghi – or, at least, they did until the British, who ruled the island at that time, told them to go away (they promptly did, and many died as a result). You can still see odd ruined buildings scattered around the island as evidence of all of this, but it’s almost unimaginable - nowadays, Kalamos is a quiet island with a population of less than 500, who, until 1996, didn’t have running water or electricity! Enjoy the beautiful scenery, clear waters, and relax a while. From Kalamos, we’re heading in a South-westerly direction, broad reaching against the prevailing wind as we breeze past the mountain island of Atokos (there’s a bay and a beach on its Southern side which might be worth a look if you have the time) and onwards to Vathi, on the island of Ithaki. Vathi is very well protected, being at the end of a natural channel, which will see you turning to the South-East for the final mile. Heading into the port, look out for some old Venetian cannons on the hillsides – they’re still in situ, but are thankfully no longer in use (though you can still imagine them making quite an impact on a modern-day yacht). Entering the port is a wonder to behold, with the whole town built up on the hillside and making a grand amphitheatre around the marina. Add some sunshine, and it really is a beautiful view. Ithaki, or Ithaca as it is also known, is perhaps most famous for its prominent role in Homers classic book, the Odyssey. Ithaki was the home of the heroic Odysseus, who sailed back from Troy and encountered all manner of mythical beasts. In recent years, researchers have discovered a three-story palace from 800 BC on the island which some believe might have once belonged to Odysseus, though most scholars still believe that Homers epic work was fictional. Vathi has a good selection of shops and tavernas, and the people here will make you feel very welcome. From the ancient literature of Homer, to a modern-day classic – we’re switching from Vathi in Ithaki to Sami in Kefalonia, which is the setting of Louis de Berniere’s Captain Corelli’s Mandolin. The romantic book features an army soldier falling in love with a local girl (and the island) whilst serving here during the second world war. The scenery is so beautiful here that they didn’t even think about shooting the film of the same name anywhere else – and if you watch the film in advance, you’ll recognise some of the streets of Sami and some of the local beaches. Sailing-wise, you’ll need to be on your toes today, as we’re going in pretty much every direction possible! After leaving Vathi, keep the coastline on your starboard side, and we’ll swing round onto the next island along. If you arrive early, the beach of Antisamos beach (the bay immediately prior to Sami) is one of the best in the whole of Greece. Sami itself is a thriving market town, with plenty of character and, particularly during the summer season, a real holiday buzz and almost carnival atmosphere. Sami is as far south as we go on this itinerary, so we’re heading Northwards and back to Lefkas island, essentially following the channel between Kefalonia and Ithaki. If you are struggling for provisions (and didn’t want to blow your budget in Sami), then we’re passing the larger town of Fiskardo at around lunchtime (when the marina will be pretty empty), so it might make sense to alight there and do some shopping – our destination for the night doesn’t have too much by way of shops. Beating up through the prevailing wind, you’ll need to bear North-easterly, and Sivota is at the end of a bay on your port side. It’s a quiet village by day, but really livens up at night, when the yachts come in to port and when the landlubbing holidaymakers finally leave their all-inclusive resorts in search of somewhere more authentic. Sivota is a beautiful place, with white limestone cliffs, sandy beaches, turquoise blue seas, white-washed houses and pine forests making it a serene and blissful place to spend the night – particularly after a few drinks in a local taverna (and some traditional Greek circle-dancing if you’re up for it). It’s a short but beautiful sail from Sivota to Meganissi, and is a great chance to appreciate the Ionian – we don’t talk about it much here, but there’s fine scenery throughout the whole of the cruising ground, and it really is a wonderful area to explore. I guess that’s why it has been so popular with sailors throughout the years. From Sivota, we’re heading pretty much due East, where, if you’re interested, you can take a look at the cave of Papanikolis. This is the second largest cave in Europe (it’s massive – over 120m long). It was once a place where local sailors hid including their boats) from pirates, and during the second world war it was used as a hiding place by Greek submarines! From here, there’s a long or a short route to Meganissi, but since time is on our side, we’d recommend travelling around the South of the island, which is a little quieter and where there are more bays to explore, then beating North into the prevailing wind and tacking back round into Vathy, on the island of Meganissi (but yes, a similar name to the one on Ithaki). Vathy is a quiet little fishing village nestled at the end of a bay, though it is fast becoming a popular tourist destination. There’s bars and tavernas splayed along the waterfront and it is almost the epitome of what a Greek sailing holiday is all about. The final leg of the itinerary, from Meganissi to Lefkas, is also the shortest. At 10 nM, you should be able to spend a decent amount of time exploring Meganissi further (particularly the beaches, which you can even reach on foot) or detouring to Nydri (or even Vlicho bay) or Nikiana, back over on Lefkas island, which are tourist destinations in their own right. Sailing North back up the Lefkas channel, the same way you came down one week ago, you can reflect on the sights you’ve seen on this voyage, the friendships you’ve made or strengthened with your crewmates, and the expert sailing skills you’ve picked up along the way. This bit of sailing is also your last chance to get a team photo whilst at sea. When you arrive in Lefkas, you’ll need to head to the fuelling berth to refill the fuel tanks. There’ll likely be a big queue as basically every yacht in the area tries to refuel within the same three-hour period. Once you’ve refilled, take the boat back to where you got it from, and moor her up one last time. Well done. Job done. Someone will come and inspect the yacht tonight, but you won’t need to leave the boat till Saturday morning. If you’ve not yet been into Lefkas, there’s plenty enough to keep you busy for the night, and it’s a great place to stroll around with an ice-cream. Alternatively, the pirate bar in the marina will be heaving with fellow sailors who you can exchange stories with. Hopefully you’ll have had a brilliant week. Sailing is super relaxing, so it’s likely that you will’ve forgotten all your passwords for logging back onto your work computer. Wait, work. Ah. Can’t you just live on a yacht all year long? Lefkas has glorious weather pretty much all year round, with regular days of constant sunshine, and barely any days of rain. Indeed, rain is very, very rare between March and October, so you won’t need to bring your umbrella. During winter, it’s a mild ten degrees - which is still just about jumper weather – but things soon start to warm up, and there’s patches of warm sunshine from late March or early April. The locals also get odd days on the beach as early as February, but these are hidden in the average figures. From April to September, the weather is delightfully warm and sunny, and the main worry is that it’s too warm – temperatures can reach the high-thirties, or even low forties in Celsius in mid August. The low forties can be a little stifling, so it’s just as well that you’ll be on holiday, and can sit quietly in the shade all day? It’s possible to swim in the Ionian sea all year long without getting hypothermia, so you should definitely pack your swimming trunks. Fifteen degrees will still feel quite fresh in the early part of the season, but by the time the sailing season is in full swing the sea will be at around 20 degrees (which is just right for helping you to cool down, without giving you shock). When the sea peaks at 25 degrees, it will feel as warm as an indoor swimming pool, which makes very inviting indeed. The whole Ionian is a great cruising ground because it has the perfect climate for sailing, coupled with exciting places to sail. The sunshine and very reliable force 3 to 6 winds mean that you’ll have fun whilst you explore the islands, and should actually be able to travel at a rate of knots. There are occasional days when the winds are either too light or too strong, but these tend to pass and the prevailing northerly winds return, driving southwards down the Greek coastline. The prevailing direction means that it should be quite straight forward for getting up and down the coast and sampling the delights and sights of the beautiful Ionian. As well as being welcomed by sailors for creating phenomenal travelling conditions, people along the coast love the reliable winds, particularly in the hot summer months, when they help to keep the temperatures bearable. Winter sailing in the Ionian is another story, as there is no real prevailing wind, and you’re as likely to be blown around by brutal and cold winds from the mountains in the North as you are by whirling tropical storms which traverse the Mediterranean from tropical Africa. What is the Current Weather in Lefkas? Lefkas or Lefkada is an island just off mainland Greece which has been populated since the ancient times: indeed, it is so ancient that it is rumoured to be the island of the Greek Goddess Aphrodite. The island has been part of various dynasties since then – including the Roman and Venetian empires, the Ottomans, and was even, oddly enough, once a part of Russia?! Nowadays, it has developed into a popular tourist area, with people flocking here for the blissful practically guaranteed sunshine, outstanding beaches, areas of incredible beauty, and, of course, classic Greek hospitality and cuisine. The island has an amazing selection of great beaches, including the beautiful white cliffs of Porto Katsiki, the turquoise sea and white sand of Egremni beach, and the windsurfers paradise of Vasiliki. Those who prefer land-based activities can enjoy some of the best mountain biking in Europe on the mountainous central region of the island, and there are some stupendous views on offer if you’re willing to pull your hiking boots on (and take on the heat of the day). 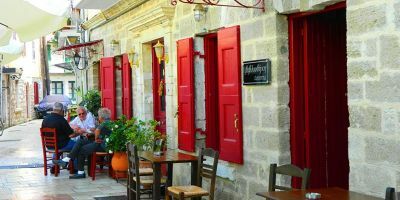 There’s always something going on in Lefkas, but unfortunately there isn’t much by way of events of national or international importance – though that doesn’t mean there isn’t culture here. You’ll find Easter and advent parades in Lefkas town - as you will in almost every village or town in Greece – which are worth observing, just to see how enthusiastically and seriously they take it. The most notable traditional ‘event’ is the Lefkas International Folklore Festival, which is held for a week in August and involves traditional dance from not just Greece, but from across the world, who have been invited to take part. It isn’t just the main stage where you’ll find performances - the whole town is filled with folklore, and you’ll stumble across remarkable troupes of performers. To loukoumadaki – the best dessert-only joint in Lefkas. You need to try their signature dish (loukoumadaki) which are sweet doughballs, served with ice-cream and honey, and are simply devine. You heard me. Delicious. (166 Mela Ioanni, Lefkas Town). Mazi ta Fagame – located in Lefkas town overlooking the marina, this restaurant has a brilliant reputation for serving quality food at reasonable prices, and we’ve certainly never been disappointed. They specialise in seafood, but the chef does a mean moussaka too. 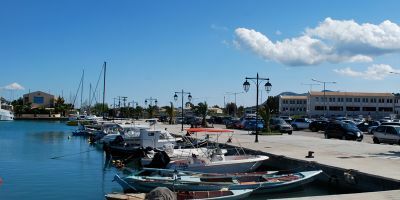 (Akarnanias 17, Lefkas Town). Pirates bar – set on a mock pirate ship in the marina, this place is usually buzzing with sailors, sometimes in fancy dress and shouting ‘Yarrr’. Meet up and share your sailing yarns, or just grab a cool beer and watch the ships come in (in the marina). 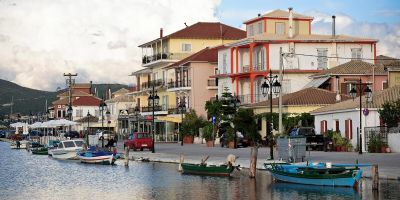 Hotel Lefkas *** – c. £55 for a double room – this hotel is one of the biggest in Lefkas old town, with over 100 rooms, all done up to a decent standard. Breakfast is included, and triple or family rooms are available. You can see the marina from the upper floors in the hotel, and it’s only a short walk to get there. Hotel Boschetto **** - c. £90 for a double room – also based in old town Lefkas or Lefkada, the Boschetto is the grandest and most luxurious hotel in the area, with stunning and spacious bedrooms, wooden floors, and fine views over the town. The marina is only about 500m away on foot. Anesis village studios and apartments - c. £44 for a double room, but bigger rooms and apartments are available – this is a couple of miles from the marina, but offers good value for money, particularly if you’re in a larger group. The modern apartments have their own balconies and kitchens, and there is a swimming pool in the resort. 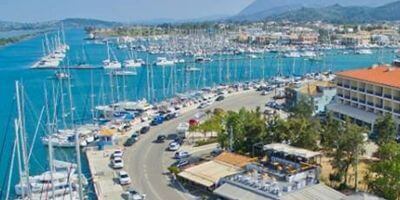 Lefkas marina is renowned as being one of the best marinas in the whole of the Mediterranean. There is space for over 620 yachts, excellent toilets and shower facilities, and water and electricity. The marina also offers a swimming pool and a small supermarket. Nestled in the town of Lefkas, a picturesque Greek holiday resort popular with Northern Europeans, all the shops and facilities you could require are within easy reach – as are the beautiful Ionian islands, once you set sail. You’ll find lots of smaller supermarkets in and around the marina, or on the way to town from the marina, but the nearest decent-sized supermarket is a couple of hundred metres the other way. 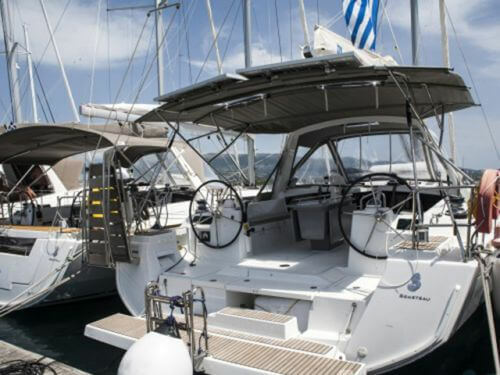 The AB (though the locals might call it the ‘Vassilopoulos’), should have everything you need, at prices you can afford. The address is Philosophorum, Lefkas. Lefkas is an island off the mainland in Greece. Whilst it is connected to the mainland by bridge, it is some way from Athens, so it still isn’t the easiest place to get to. The best way to arrive in Lefkas is by travelling by air. The nearest airport to Lefkas marina is Preveza airport, which is 35km away inland and used by domestic and international airline companies. From there, you can get a taxi or minibus direct to the marina – ask our team and we will be able to sort out transfers for you – or you can look out for the local bus to ‘Lefkas town’ and then walk to the marina from there (Unfortunately, the buses only depart once every 2-3 hours during the day, but it does go direct to Lefkas). An alternative route to Lefkas marina is to fly into Corfu airport and to take the passenger ferry across – but you might be better off just chartering a yacht in Corfu and sailing from there instead?